The LCN-GT2 is a sensor-touch panel connected via the I-port of any LCN module of version 1403 or higher (March 2010). 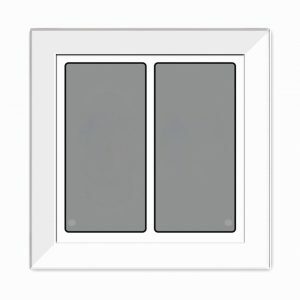 It is designed for mounting in a flush mounted wall-box and can be fixed firmly on the wall by means of a special mounting plate. The capacitive sensor surfaces are positioned behind a 5 mm thick glass panel. Slight contact with the surface is sufficient to trigger various functions. The intelligent control system distinguishes between tapping, prolonged contact and releasing of the keys, with the result that 3 commands (Hit, Hold & Release) are possible per key. A status LED which is integrated into every sensor reports on the current status of any actuator or sensor in the building with 4 indicator modes. The touch panel sensor pads can be labelled individually and easily changed if necessary. Background illumination on the sensors (optional) allows the LCN-GT2 to be used comfortably with low room lighting. The individual labelling of the sensor surfaces can be transferred to paper/film and placed behind the glass panel. This labelling can be replaced at any time, which means changes to the key assignment are no problem. The LCN-GT2 is for mounting in interior dry rooms. It can be used for every switch, regulator and operational task within the LCN bus system. It is especially suited to the design orientated user who demands high performance and comfort. Up to 4 LCN-GT2 can be operated via the same module in parallel.